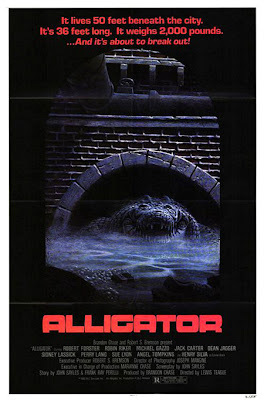 Ananka's Diary: Happy Alligators in the Sewer Day! Yes, it's a real day! 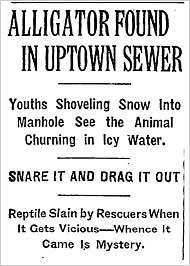 Seventy-five years ago today, a teenager discovered an 8-foot alligator at the bottom of a manhole in Harlem. The event was even written up in the New York Times (see below). According to a former superintendent of New York sewers (a man once known as the King of the Sewers), that 8-footer wasn't alone. When the man went down into the sewers see for himself what was there, he found . . .
Alligators serenely paddling around in his sewers. The beam of his own flashlight had spotlighted alligators whose length, on the average, was about two feet. Some may have been longer. Avoiding the swift current of the trunk lines under major avenues, the beasts had wormed up the smaller pipes under less important neighborhoods, and there Teddy had found them. The colony appeared to have settled contentedly under the very streets of the busiest city in the world. someone should track down that sewer king. so the rumors areeee true!!! i read a story (or "myth" may be more accurate) sorta like that: it was back when having alligators for pets was still legal. a father bought his son a baby alligator for a pet, but they soon realized that alligators actually aren't all that pleasant to have around. so they flushed it down a toilet and apparently some worker found a baby alligator down there a few days later... weird. who else plans on participating in the contest? lol i like how he described it as serenely paddling :) im so happy because i hav a snow day today!!!! I'm actually on snow day #7 today! my friends and i are hoping for friday off as well, so we can see a matinee of the percy jackson movie! when are they going to make a kiki strike movie? Everything interesting happens in New York. Does anybody notice how many blizzards are hitting us? It's like that movie! The Day After Tomorrow! One's headed to New York Kirsten. I dunno if I'll participate. I'm still thinking about it since I'm not terrific at drawing, I haven't read Kiki Strike in a while, and phrases eldue me . . . IT SNOWED ALMOST THE WHOLE DARN DAY!!! YAY YAY YAY!!! Kira- AAAAH! Percy Jackson!! Can't wait to see that!!! EEEP!! That is SO BIZZARE!!! Over here on the west coast we have spring early. I am kind of disappointed because the snow on the east coast is slowing down the shipping of my ninja umbrella :( I am SO EXCITED for The Lightning Thief!!! I have a Camp Half-Blood t-shirt and necklace, and I am going to the first showing because we have school off on Friday!! YAY!!! wow im on snow day #2 now =] this is so great because my school district hardly ever closes!! this is the first time this ever happened!!! LOL I emailed this to all my friends and they got freaked out. Now everywhere they go I say, "Hey look, a sewer grate!" and they jump like 12 feet in the air it's so funny! I saw The Lightning Thief a few hours ago. IT IS SOOOO GOOD!!!! It really is NOTHING like the book, but it is still AWESOME!! I get to see it again in two hours. When is there gunna be a Kiki Strike movie?? I dunno about a NATIONAL Kiki Strike Day, since probably on the whole, a very little percentage of the population has heard about KS, but what about a Be An Irregular Week? Y'know, spy a little more, take an impromptu Kung Fu class, visit the library, work on some kind of gadget (to hack or fix) . . .
happy valentines day Kristin!! i hope oyu get a big box of chocolates!!!! OMG I can't wait 4 percy jackson eather!!!!!!!!!!!!!! That is very intresting, how did they (the alligators) get there? !